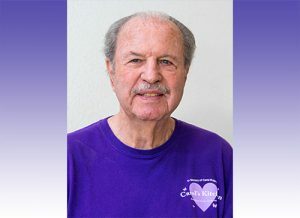 Vince Oddo has volunteered with Carol’s Kitchen for three and a half years at the Banning Community Center. Before coming to the San Gorgonio Pass, he worked and lived in El Monte then later Rancho Cucamonga, having served as a volunteer firefighter for 14 years (before these cities employed firefighters). Vince has two children and seven grandchildren and is currently enjoying life in Banning with his wife Flo. I am originally from Rancho Cucamonga. My wife passed away. My ex neighbor was single and we got together. She already had a home in the north part of Sun Lakes. She sold her house in Rancho and we bought a house together in Banning. Now we are living happily ever after. A couple of friends work at Carol’s Kitchen; they live at Four Seasons. I was looking for a place to volunteer. They talked about the kitchen and I figured I had to try it out. I enjoy taking care of big people and little people. I found myself with spare time and always wanted to help those less fortunate than myself. I enjoy the camaraderie down at Carol’s Kitchen. We’ve got a good bunch of people there! I work the front door, hand out tickets when our guests come in for food and when they leave, we give them produce and other cookies, cakes, breads and other fresh foods to take home. What have been your favorite experiences Carol’s Kitchen? I enjoy meeting the people, big people and little people. Making sure they’re happy. I’m looking forward to Christmas, Santa Claus will be coming by at some point to hand out gifts to the kids. One of our volunteers owns a hardware store nearby and she donates a lot of items for the Christmas giveaway. Carol’s Kitchen does a nice job. A lot of people need help. Come in and meet Vince sometime! Volunteer or enjoy a meal at our Tuesday or Friday kitchens at Banning Community Center.